Anheuser-Busch, the maker of Budweiser-and the largest brewery in the United States-- is taking a leadership role in employing alternative energy technology in its 12 breweries in the U.S.
Anheuser Busch, the maker of Budweiser-the King of Beers-is also the king of BERS, which is shorthand for the company's Bio-Energy Recovery System. The BERS process uses anaerobic digestion to convert most of the brewer's nutrient-rich wastewater to produce methane, which in turn is used to heat boilers used in the brewing process. "We are actually the largest operator of anaerobic digesters in the world because it is such a natural fit for us," says Greg Kellerman, Anheuser-Busch Director of Utilities and Wastewater Operations. However, BERS is only one small component in the brewer's quest to achieve at least 15 percent renewable energy use in all of its 12 U.S. breweries by 2010. Last year, the company's Houston, Texas, brewery also started using biogas that is recovered from a landfill owned and operated by Republic Services. This is in partnership with Ameresco Services, which is the operator of the biogas recovery system at the landfill. When combined with the biogas recovered from its BERS installation, biogas will provide 70 percent of the brewer's energy needs at its Houston facility. Anheuser-Busch conducted extensive research concerning potential alternative energy tie-ins using resources available from the Department of Energy, specifically, the National Renewable Energy Laboratories (NREL) in Golden, Colorado. The NREL offers a service where companies provide the addresses of their locations and some basic thermal and electrical demands. The NREL then provides an overall priority list of the most likely renewable solutions, including solar, landfill gas, wind, and other renewable alternatives. They also consider the state where a facility is located and any potential incentives that state may offer for companies to convert to alternative energy. That's how landfill biogas was deemed the best option for the Houston brewery and solar power for the Anheuser-Busch brewery in Fairfield, California. "It was a nice way to narrow down our search," says Kellerman. "That way, we could focus on the data that indicated what were the biggest opportunities for us at a specific location. "It didn't answer all our questions, but it certainly helped us separate an overall concept into a strategy and defined some steps we could take." The NREL identified landfills where biogas was already being captured in the vicinity of the company's breweries. The McCarty Road Landfill in Houston became the primary choice for several reasons. It represented the shortest distance for the installation of a gas pipeline from the landfill to the brewery, it delivered the largest amount of biogas among the candidates considered, and it also had a company with a proven track record-Ameresco Services-already involved in capturing and marketing the landfill gas. Anheuser-Busch has invested in solar power for its Fairfield brewery in California, signing an agreement with SunEdison to host a 1.18 Megawatt solar power plant. The system generates about three percent of the brewery's electricity needs and also generates Renewable Energy Certificates. In terms of the Houston biogas project, Kellerman says it seemed like a natural fit. "We have a fairly steady thermal demand, and landfill gas projects are usually based on serving customers that have a constant heat demand." Partnering with Ameresco also worked in the project's favor. "We wanted to find somebody that was credible that could put a six-mile pipeline across a portion of the City of Houston," says Kellerman. "It had to be somebody that was able to get through the permitting and easement processes with the city. It was going to have to be somebody who was fairly established, and Ameresco fit the bill." Ameresco was responsible for building the pipeline and Anheuser-Busch was responsible for modifying its boilers so that they could burn the landfill gas. The entire project took about two years. Completion of the project represented a significant milestone for the brewer because it was the first time that one of its boilers was being fueled by three gas streams-natural gas, the biogas produced from its BERS system, and the landfill biogas. The boilers were installed in the 1960s and 1970s, and Anheuser-Busch believes it is the boiler manufacturer's first customer to combine three energy streams as the fuel source. "It had some experimentation associated with it, and it took us a while to get things settled down," says Kellerman. "But it has turned out to be a great project for us. We actually blend the three fuels into several boilers. So, we have boilers that are capable of operating on all three fuels at the same time." On the West Coast, Anheuser-Busch has invested in both BERS technology and solar power for its Fairfield brewery. 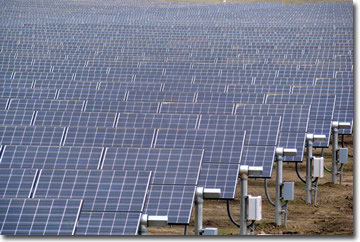 It has signed an agreement with SunEdison to host a solar power plant on its Fairfield property. The panels are ground mounted and able to track the sun. The 1.18 megawatt photovoltaic system constructed in 2009 generates about three percent of the brewery's electricity needs and also generates Renewable Energy Certificates (RECs) for individuals or businesses to purchase to offset their use of fossil fuel energy and greenhouse gas emissions, although generating RECs was not a motivation for Anheuser-Busch to proceed with this project. The biogas generated by the BERS installation at the Fairfield brewery generates about 15 percent of its energy needs. 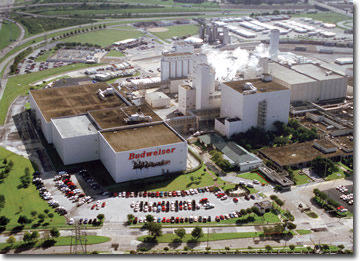 Anheuser-Busch conducted extensive research concerning potential alternative energy tie-ins for its facilities using resources available from the Department of Energy, specifically, the National Renewable Energy Laboratories. Newark, New Jersey, and the brewer is actively looking for additional locations for roof-mounted solar projects. Two companies provided the equivalent of "one-stop shopping" for the solar projects: SunEdison for Fairfield and Wisconsin-based Orion Energy Systems for Newark. Satcon provided the inverters for both Newark and Fairfield. Both the landfill biogas project in Houston and the solar power partnership in Fairfield were new ventures for Anheuser-Busch. The application and installation of the brewer's BERS technology has been part of the company since the mid-1980s. It is essentially a process of using anaerobic digesters to convert the sugars and carbohydrates in higher strength wastewater to biogas, resulting in the discharge of lower strength wastewater. After the brewing process, the wastewater byproduct first undergoes a screening process to capture larger solids, and then the liquid is collected in equalization tanks where its pH is balanced. Once balanced, the wastewater proceeds to oxygen-free, anaerobic digestion reactor vessels where bacteria convert the wastewater nutrients into methane. The gas is collected, compressed, and transported for use as fuel in the boilers. The remaining liquid stream is either collected in a lagoon and undergoes an additional aerobic process or is discharged into the municipal wastewater system. The wastewater discharge quality is strictly enforced and monitored through a permitting process. The amount of solids collected from the screening process varies at each location and is sold to other companies for a variety of uses. The biomass that collects over time in the anaerobic digesters is most often sold to other companies as seed material for their own anaerobic digesters. "We need heat-the anaerobic digesters work so great for us because we can take this higher strength wastewater, put it through an anaerobic digester, convert those sugars and other components into methane, and then use the methane in our boilers to generate steam," says Kellerman. "It is a perfect little closed loop that makes it such an attractive solution for us." 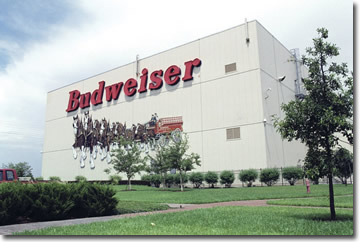 The beer manufacturer has used three different anaerobic digester vendors for its BERS projects and each installation tends to be somewhat unique according to the needs of each facility, although they must all function within performance standards established by Anheuser-Busch. 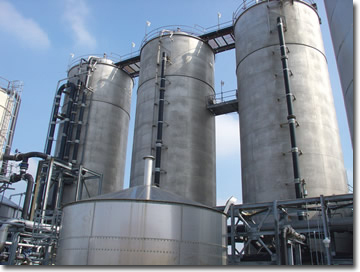 Most of the anaerobic digesters have been supplied by Biothane Corporation. One digester has been supplied by Netherlands-based Paques bv and another was supplied by Global Water Engineering Limited. The installation cost has come down since the 1980s as the technology has developed and more vendors have entered the market. Also, this type of technology is now commonly used in breweries throughout the world as, like Anheuser-Busch, many brewers have discovered that applying anaerobic digestion technology like BERS is not only good for the environment, but is also good for business. "There are business advantages to reducing the strength of our wastewater," says Kellerman. "If we don't do it, the municipal wastewater districts have to do it. Obviously, they need the capital and the rates from us to do that conversion. So BERS does reduce our overall wastewater costs, and it offsets up to 15 percent of our fossil fuel demand." So far, BERS technology has been installed at 10 of the company's 12 U.S. breweries, and another installation is currently in the planning stages. Transitioning to greater use of alternative fuels is taken very seriously at Anheuser-Busch, as demonstrated by the company's participation in the Environmental Protection Agency's Climate Leaders program, which it joined in 2007. "As we headed down this journey to conserve more and convert to renewable fuels, we thought that it would be valuable to get an independent review from an association like Climate Leaders so that they could test us on our reduction goals and to see whether we were comparable to other companies," says Kellerman. "It was an opportunity for us to really think through where we wanted to go in this whole area and then to really challenge ourselves publicly to make sure we actually did what we said." He adds that participating in Climate Leaders has helped Anheuser-Busch network with other companies and learn what approaches they were taking in the alternative energy arena. "These are new roads for many of us," says Kellerman, "so just being able to reach out to others that are travelling down similar paths, you can learn from those conversations and maybe get there more quickly than you would if you were completely on your own."